Mar Ephrem Nariculam was born on 10 December 1960 at Nayarambalam in the Archeparchy of Ernakulam-Angamaly as the son of Late Thomas and Late Thresia Nariculam. Having completed his school education at St. George Vadel and Bhagavathivilasam School, Nayarambalam, Fr. Ephrem joined the Minor Seminary of the Archeparchy of Ernakulam-Angamaly. He completed his Philosophical studies in Sacred Heart Seminary, Poonamally and Theological studies in St. Joseph’s Seminary, Mangalapuram. 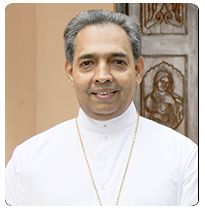 He was ordained priest by Cardinal Antony Padiyara on 27 December 1986. After ordination he served as Assistant Parish priest in Kanjoor, Koratty and Ernakulam Basilica and as Assistant Chaplain in the Delhi Syro-Malabar Mission and later as Rector of the Minor Seminary of Chanda. He secured B.A. in English Literature from Kerala University, B.Th. from the Urban University, Rome and Masters in Inter-religious Dialogue from Vidya Jyothi, Delhi and Doctorate in Theology from the Indian Institute of Spirituality, Bangalore. Fr. Ephrem was a visiting professor in the Major Seminaries of Nagpur and Vadavathoor and from 2007 onwards he was serving as Professor in the St. Augustine’s Faculty of Theology of Toronto University, Canada where he received his appointment as Bishop of Chanda. He is also serving as the spiritual father, priestly formation coordinator of the seminarians as well as Chaplain of the Permanent Deacons’ Theology Programme in St. Augustine’s Seminary, Toronto, Canada. For brief period he has also served as parish priest in the Syro-Malabar parish in Toronto. In 2000, he took a diploma in priestly formation from the Regina Apostolorum University, Rome. He has conducted many retreats in English and Malayalam in many parishes in Canada and the US. He has published some articles in English and has been a constant contributor to Ephatha, the publication of Toronto Syro-Malabar Parish. He was ordained bishop on 24 October 2014. Fr. Antony Nariculam, Rector, Pontifical Seminary, Mangalapuzha and Sr. Sherly SMI who is working in Guwahathi, Kochutheresia, Poulose, Josukutty, Marykunju, Aathappan, Kunjumol, Elsamma are his siblings. Two of his siblings, Alice and Vakkachan passed away a few years ago.